Hey y'all! Welcome back for the next Mama Elephant's April release highlight! 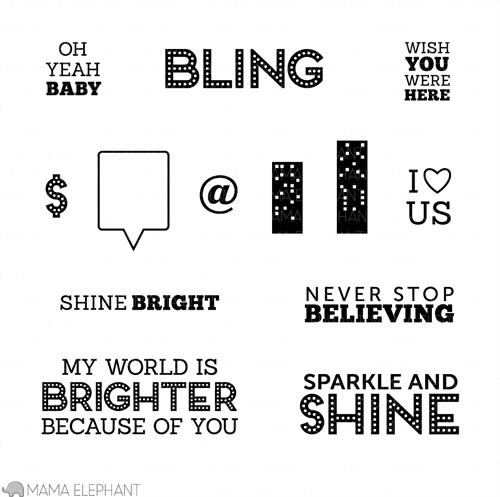 The new release is already available in the store as we feature the new releases one by one:) The second set to highlight is Bling! 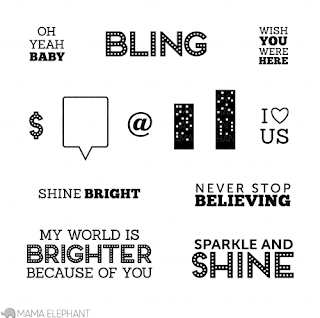 You know that Mama Elephant is known for it's fresh and fun sentiment sets and they've done it again with this set! If you love to do bright and colorful backgrounds, this is the just the set you NEED! (Can you say blended ink, sprays, or washi tape?) Of course, after I said that, I totally went for a different approach;) I decided to emboss my sentiment using multiple embossing powders in the brightest colors I could find! This card is actually 3 pieces: the card base, the pink panel (cut on an angle), and the embossed panel with the sentiment (also cut on an angle). To get that perfect color match, I embossed the edge of the pink panel with the same embossing powder as I used for the sentiment. To get a really bold saturated stripe, I used scortape instead of Versamark to adhere the embossing powder. I love how all the neon pops off the black! Thank you for checking in on me today:) Please go visit the other Mama Elephant team members and see what they did this hot set! Come back tomorrow for the next highlight from the April release! Thanks for stopping by and have a great day! that is so super cool! did you sprinkle your powder just a bit at a time, one color at a time? The multicoloured embossing here is so cool JJ! Love the tying in with the embossed strip too! This is awesome! That sentiment really pops off the page! JJ this is such a cool card, loving the neon! FAB! Love the bright embossed colors...the black really makes it pop! Scor-tape? I would never had thought of that, you are a genius! I LOVE the multi-colored embossing too! AWESOME! Love the neon against black and the diagonal design. Such a 'wow' card! This card is awesome! 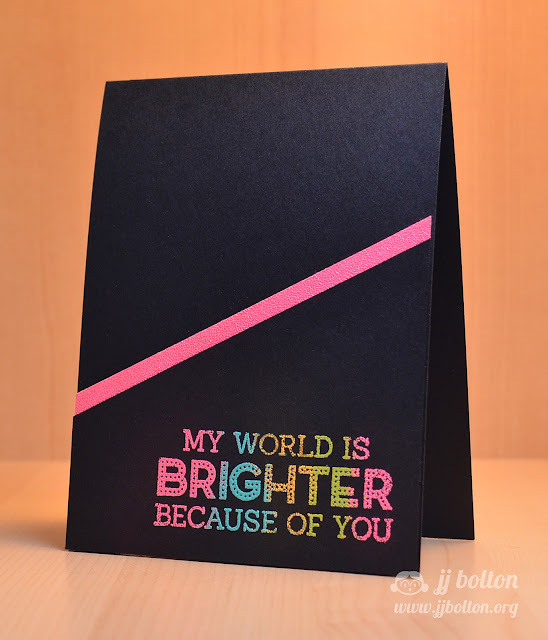 Love the multicolored embossed sentiment, and the bright angular strip tying it all together! Fabulous card JJ! Loving the neon against the black card base! Very pretty, LOVE neon and black! This is so eye catching and bold. Neat trick about using the scor tape to hold the embossing powder. I'm going to try that some time. Oh so very Eighties (but in a super-cool kinda way, not in a big hair kinda way)! I've tried that multicolored embossing and it never ended well once I started using more than two colors. Yours is FAB! This is so cool and bright! The neon colors are awesome! I loooove it! I love visiting you at release time, always enjoy seeing how you use the new stamps. Oh, that is a brilliant idea using Scor-tape to emboss! The coverage would be awesome. And I love the different bright colours you used - they REALLY pop on the black!